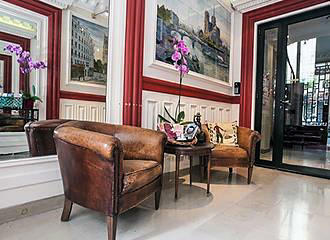 This is an Aparthotel located in the 16th Arrondissement where you have your own complete apartment that includes a separate living area and bathroom along with a kitchen and dining area, yet with the added benefit of being like a hotel with daily cleaning, concierge services available, free WiFi, direct line telephone and much more for that home from home feel. 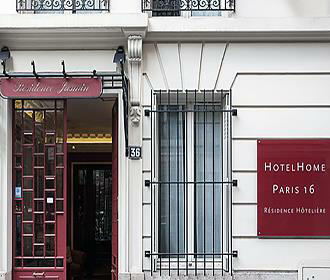 HotelHome Paris 16 has recently been renovated to provide 17 apartments ranging in size from approximately 30 metres squared up to 65 metres squared, and are designed in a typical Parisian style, with the charm of a guesthouse, but services of a plush hotel. With old style charm of the building but modern technologies, you will have access to free WiFi, electronic key entry to your apartment, which is individually heated or air conditioned for you to set as you wish and your own direct line telephone with voicemail capabilities, there is also a secure access code to even enter the building. Bilingual staff speaking both French and English, are there to help you with restaurant reservations, booking tickets for tours or shows in Paris, etc, and the normal hours of reception are from 9:30am through to 5:30pm, although this could be later in the evening if there are arrivals or departures. Yet even out of hours, staff are only a quick phone call away for any help. 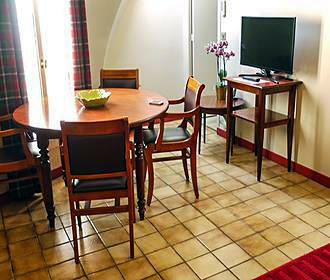 The staff or recognised professionals at this Aparthotel in Paris are also able to provide personalised services to cater for your needs, such as secretarial services, babysitting, meal delivery, shopping, sending or receiving faxes, laundry and dry cleaning, etc, some which do carry additional charges. 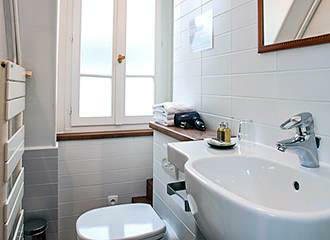 However, HotelHome Paris 16 also has a dedicated laundry room in the basement that you can utilise, plus there are two secure parking spaces available in the basement of a building located nearby, which can be booked with your apartment for those of you that are arriving with your own vehicle. 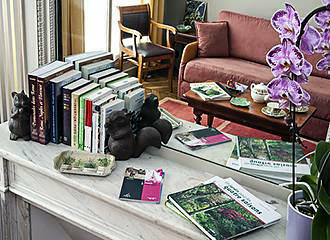 There is a small area by reception on the ground floor where you can relax, or even enjoy the interior courtyard garden and if you arrive prior to your apartment being ready, which is 2pm, then HotelHome Paris 16 will take care of your luggage, so that you can start to enjoy the city from the minute of arrival. When it comes to the maid service and cleaning, a discreet, professional service is offered daily to refresh your apartment by making beds, cleaning the bathroom and emptying bins, which is actually very unusual for an Aparthotel or serviced apartment. Then every three or four days they get a full clean with new towels, bath towels, bedding, tea towels, etc, although for an extra charge you can request this more frequently. As we mentioned earlier, the HotelHome Paris 16 has been fully renovated and there are actually two buildings that accommodate the 17 apartments, with the main building having two apartments per floor that are accessible by lift. Whereas the second building has one apartment per floor, yet is only accessible via a staircase. Within the main building, you have the reception area on the ground floor, then the first floor to the fourth floor have a twin suite apartment and a double suite apartment on each floor. On the fifth floor is a family suite apartment with three bedrooms along with a double suite apartment, and on the sixth floor there is a family suite apartment with two bedrooms along with a twin suite apartment. The second building has one junior suite apartment per floor, from the ground floor to the fourth floor, but as we mentioned earlier, these are only accessible by stairs. However, if your party is larger than a family suite, you can also book an additional apartment on the same floor, which means the entire floor would be privatized just for yourselves. At this Aparthotel in Paris you will find complementary toiletries along with heated towel rail and hairdryer within the bathrooms, plus a welcome pack with tea, coffee, milk and sugar are supplied for your arrival. Each also has a fully fitted kitchenette or kitchen, which includes sink, hotplates, fridge, combi-oven that includes a grill, oven and microwave, kettle, coffeemaker, toaster and kitchen utensils as standard. You will find that HotelHome Paris 16 caters for families and businesses with exceptional rates for medium and long term stays, although short stays are also possible, and by booking direct you can get discounts such as 20 percent off for a stay of over 5 nights, and even up to a 40 percent discount for a stay over 20 nights. Now starting with the 5 Junior Suites, these are approximately 30 metres squared with a view over the courtyard garden and can accommodated up to 3 people by adding an additional bed. They come with a double room with storage cupboard, desk, fireplace, shower room, small lounge with dresser containing crockery and glassware, dining table and chairs plus a kitchenette. There are 5 double suites, which are approximately 45 metres squared and can accommodate up to 4 people with one separate bedroom and a lounge with furniture that can convert to a twin sofa bed as two separate beds, plus these have a small fully fitted kitchen, which even have a small dishwasher and rather than just a shower room, these also have a bath. HotelHome Paris 16 also has 5 twin suites that are approximately 35 metres squared with twin beds in the bedroom, but a double sofa bed in the lounge along with armchairs, and again a fully fitted kitchen with a small dishwasher. You will find that there is 1 family suite with 2 bedrooms and a lounge that can accommodate up to 6 people, and has 2 shower rooms, which are actually separate from the bedrooms, plus there is a double sofa bed in the lounge and armchairs, not forgetting the dining table and chairs plus a fully fitted kitchen with dishwasher. Then there is the family suite of 3 bedrooms and a lounge, which just like the other family suite, is an approximate size of 65 metres squared that can also accommodate up to 6 people and has the same facilities such as 2 independent shower rooms, fully fitted kitchen, etc. So as you can tell, HotelHome Paris 16 is your home away from home with comfort, peace and tranquillity plus practicality being the key words to describe this Aparthotel that is located close to popular tourist attractions. Located in the 16th Arrondissement close to tourist attractions in Paris like the Bois de Boulogne, Roland Garros Tennis Stadium, River Seine and many more, this Aparthotel is ideal for people visiting the city on holiday or for business. As we mentioned earlier, HotelHome Paris 16 has two dedicated secure car parking spaces in the basement of a nearby building that can be booked alongside the apartment of your choice, although there are parking spaces sometimes available on the road outside the Aparthotel. However, for those of you arriving by public transport in Paris, you will find that the nearest Metro station is the Jasmin stop serving line 9, which is in a northerly direction, however, a little further walk in a southerly direction and you have the Michel-Ange-Auteuil stop serving lines 9 and 10. Alternatively, the bus lines 22 and 52 will also get you very close to HotelHome Paris 16, however, a little further away,, but still in walking distance as though heading west towards the Bois de Boulogne you could utilise the bus lines 32 and PC1, which is also known as line 97. Whereas the nearest RER train station is on the opposite side of the River Seine by going over the bridge called the Pont Mirabeau and this is the Javel stop serving the RER C line.